Now you can bring super telephoto capabilities to your Nikon 1 system with the compact, lightweight 1 NIKKOR VR 70-300 f/4.5-5.6 lens. Open an exciting new world of shooting opportunities—nature and wildlife, professional sports, concerts, performances and much more. 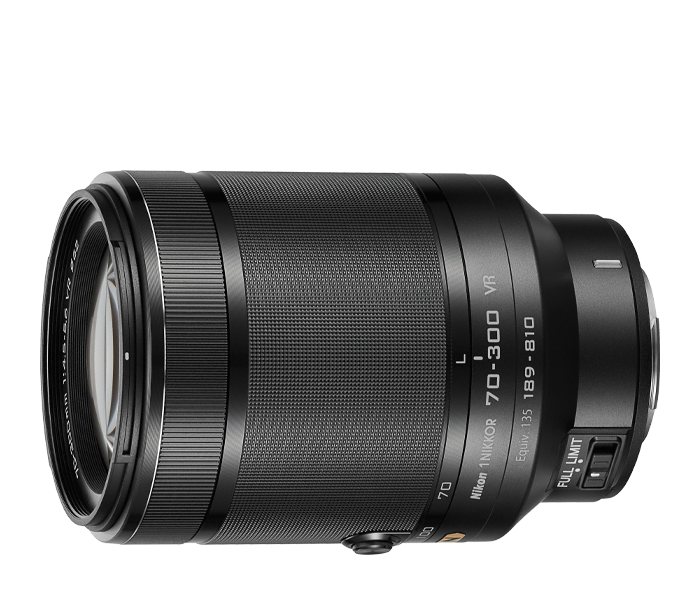 With a zoom range equivalent of 189mm–810mm (35mm format) and advanced Nikon lens technologies like Super ED glass and Nano Crystal Coat, the 1 NIKKOR VR 70-300 f/4.5-5.6 packs the zoom power and outstanding performance of a massive D-SLR lens into a compact, lightweight 1 NIKKOR package. With the super telephoto power of the 1 NIKKOR VR 70-300 f/4.5-5.6 lens, exciting new shooting opportunities are around every corner. Shoot detailed close-ups of wildlife, concert performers, athletes, fast action and more. At its widest setting (70mm in CX-format, equivalent to 189mm in 35mm format), the 1 NIKKOR VR 70-300 f/4.5-5.6 is great for portraits, outdoor events, family fun—anything that requires a bit of zoom. Zoomed all the way in (810mm equivalent in 35mm format) it delivers the power. For over 80 years, NIKKOR has been a leader and innovator in optical technologies, and the 1 NIKKOR VR 70-300 f/4.5-5.6 lens incorporates some of NIKKOR's most exciting advancements. Its the first lens in the 1 NIKKOR lineup to use Super Extra-low Dispersion (ED) glass, which provides stunning sharpness, contrast and colour rendering. It also features Nano Crystal Coating (N), which nearly eliminates lens flare and ghosting for clearer, sharper images.